This set is sold but can be custom made upon request. 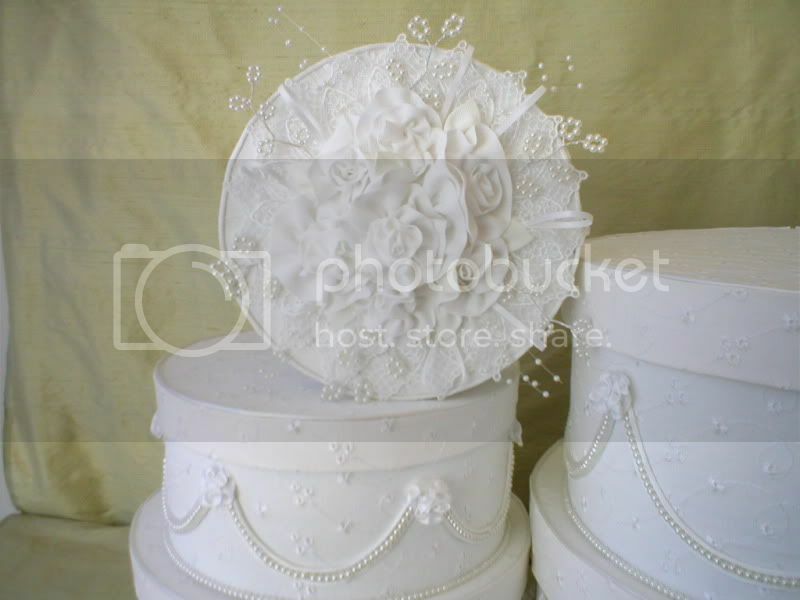 This item is for a beautiful Set of 5 Wedding Hat Boxes, covered in shimmering White Eyelet. The lid of the smallest box is decorated with a gorgeous Nosegay of Roses, White Venice Lace, and Pearls. 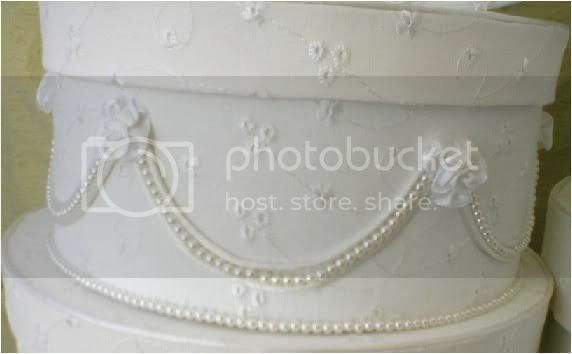 The sides of the entire set are decorated with fabric roses and swags of satin cord and seed pearls, from top to bottom. This beautiful set is just right for Wedding and Bridal Shower table decor. 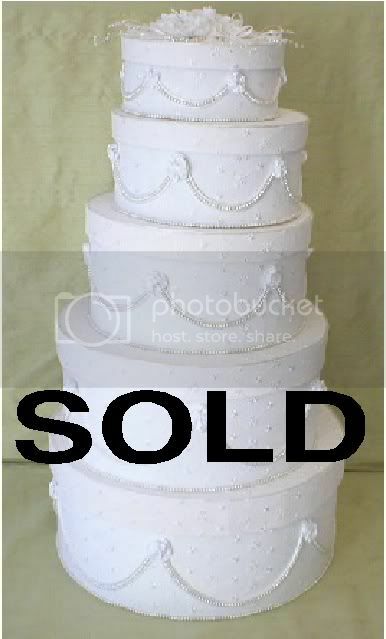 Looks like a beautiful wedding cake! DIMENSIONS: 7 x 3", 8.5 x 4; 10 x 5; 12.5 x 6; 14.5 x 6.5. Measures Diameter and Height. We can custom make wedding and gift card boxes to your specifications on our website. All of our items are hand made in our Smoke and Pet Free design studio. These are not the mass produced, or overseas imports so common on the internet. Your satisfaction is always guaranteed. We always charge the exact shipping from our zip code to yours. We never inflate our prices with excess shipping and handling fees. Please feel free to contact us with any questions. Please wait for our invoice before paying, so your boxes can be packed and weighed for exact shipping cost. Discounts for shipping on multiple purchases.